A friendly local company with many years of knowledge and experience in all types of heating and plumbing, Gas Safe registered and experienced in renewable energy, underfloor heating and unvented cylinders. Fully qualified and insured in all aspects of heating and plumbing. Not the cheapest but well worth the little bit extra. Power flush system and new boiler fitted. Excellent service kept me well informed at each stage. No mess everything cleared away at the end of the day. Dan fixed a broken water pipe in the loft. He was recommended to me by my estate agent. He got the job done as quick as possible, doing it there and then. He is quick to respond to messages and reasonably priced. 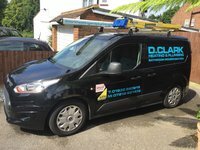 I have used D Clark Heating & Plumbing for several years to carry out Gas safety checks and plumbing repairs all completed in good time and quality. Dan replaced the waste pipe in two sinks where the previous ones had corroded at the drain . He arrived when he said he would did the work efficiently and billed us a few days later. He also willingly provided me a quote for a new boiler just to give me an idea of cost as I will need to replace the one at some point but not in the near future. I would recommend his work I have used him several times before. Had a smart meter fitted last week and they found there was a hole in the flue which is very dangerous. Dan and his team were excellent and fitted new one. They were reliable polite informative and did a great job. Will definitely use them again and highly recommend. Keep up the good work guys!!! Gas leak, and broken boiler. A great service, everything clearly explained and costing discussed beforehand. I can't recommend Dan enough for anyone who has any plumbing issues. Quick, reliable and efficient. We will be using him again in the future.